There’s something in the way Jackie Robinson holds a baseball bat. He treats it with nonchalance; it’s almost an accessory to carry while wearing a baseball uniform. But when Robinson stands at home plate, holding this same bat, he slugs the ball with a sharp crack! that happens so quickly you can hardly believe he actually hit the ball. The Jackie Robinson Story (1950) examines the life and early career of the famed Number 42, the first African-American to play in the major leagues. The story was later retold in the 2013 film 42, starring Chadwick Boseman. While the 1950 film has a more modest budget than the 2013 version, it has one huge advantage: It stars Jackie Robinson as himself. Now, Robinson is not what you’d call a classically-trained actor, but who cares! We get to see Jackie Robinson play baseball! The Jackie Robinson Story is like being at a ball game, with all the sounds of a game: the whack of the ball against the bat; the roar of the crowd; the chatter in the dugout. This film was made by folks who love baseball, and they’ve not skimped on footage of Robinson hitting and stealing bases. But the film isn’t just about the game of baseball. It’s about the concept of baseball – who the game is for and who should be allowed to play. 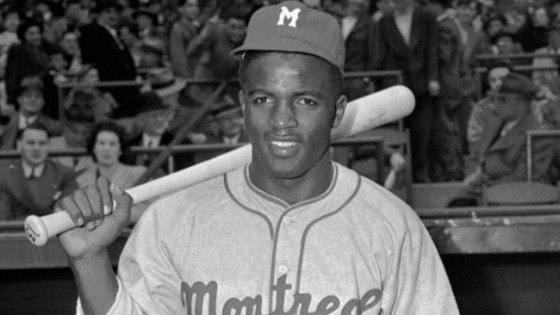 In 1947, Robinson is signed to the Brooklyn Dodgers to play for their farm team in Montreal. He is the first African-American ball player in the major leagues. Sports reporters are waiting when Robinson steps out onto the Montreal field for the first time. They ask if he thinks there’s going to be trouble. “The only trouble I’m worried about is a ground ball to my right,” he quips. The reporters are not asking about ground balls and Robinson knows it. He’s reminding them he has the right to play baseball. In the scene where Robinson is initially signed by the Dodgers, the owner (Minor Watson) sits at his desk and lights a cigar as he carefully studies Robinson. For a moment, we are uncertain of Watson’s motives: does he sincerely want to hire Robinson, or is he going to humiliate him? But as Watson pointedly stares Robinson, we realize he’s analyzing the athlete, not the colour of his skin. “We’re tackling something big here, Jackie,” Watson says. “If we fail, no one will try again for 20 years.” He tells Robinson that the going will be rough; fans will throw insults at him, and opposing players will run at him spikes first. Watson a ballplayer is needed who has guts enough not to fight back. Robinson is that player, and he takes everything on the chin. He’s booed when he steps up to the plate. Fans shout obscenities at him and pitchers aim for his head instead of the strike zone. Yet, Robinson sells tickets. Love him or hate him, everyone wants to see him play. The Jackie Robinson Story is a movie about breaking the colour barrier and a remarkable pioneer major league player. But it’s also a love letter to a game made better by Robinson. The Jackie Robinson Story: starring Jackie Robinson, Ruby Dee, Minor Watson. Directed by Alfred E. Green. Written by Lawrence Taylor and Arthur Mann, Samson Raphaelson. Jewel Pictures Corp., 1950, B&W, 77 mins. This post is part of the Big League Blogathon hosted by Forgotten Films. Be sure to read all the contributions celebrating the great game of Baseball. Next Great Villain Blogathon Reminder! From my perspective the movie itself is just ok, though to be honest I am not a baseball fan. That said, I agree with you in that this isn’t really about baseball, or anything else as pedestrian as a mere sport. Rather, it is a striking social commentary that really should be required viewing for younger generations. Jackie Robinson was not the greatest ball player when you look at stats (though very good he was). What this film does is make you take a step (or two or three) back and realize the shattering impact he had on the game- and more importantly society. Perhaps one of the most socially important messages of our time. I much prefer this version to 42, much of which was filmed here in Birmingham, AL. Ruth, The Jackie Robinson Story is worth seeing because of the courage involved back then. You did a fine job of explaining why it’s a milestone in both movies and real life. Well done, my friend! Great movie. Great player. Great man. And a great post. Really, you said it all so beautifully that nothing else needs to be added. Thank you for that. Thanks, Paul! Every time I see this movie I’m amazed that Robinson could focus on the game while all the other nonsense was going on. I love watching the scenes of him stealing bases. It must have been so exciting to see that in person. I truly believe this film ought to be required viewing for today’s athletes. I love baseball (am a major Red Sox fan), and I watch a lot of games throughout the year. There is a huge anger issue in the game (watch people charge the mound when they come close to getting hit by the ball). It’s easy to give vent to your anger—it takes a much stronger person to control his anger and to not lash out when wronged. Jackie Robinson was often wronged, but he held his anger. Today’s athletes (and society in general) ought to follow his example. It is remarkable how Robinson could control his anger. Really, it’s almost superhuman. I agree with you – many present-day athletes could learn from Robinson and what he teaches all of us about life. It is amazing that Jackie could take such abuse each and every time he set foot on the playing field and still play the game, let alone excel at it. How terribly wrong things would have gone had he, just once, responded in kind. This was true courage. I loved this film and I do mean to see “42”. I’d love to compare the two but, as you say, the original has The Original. BTW, doesn’t Ruby Dee look wonderful? “42” is a terrific movie and is, frankly, much better than “The Jackie Robinson Story”. But the original movie has an earnestness and Purpose. And, like you said, it has The Original. I hope you get a chance to see both movies. They are worth it. Sounds like I need to see this one even though I know it will make me sad to watch another human being treated that way. I am amazed at Jackie Robinson’s courage, and look forward to viewing a movie about such a role model. I appreciate the dialog you chose to highlight in this movie, Ruth. It gave me a feel for the movie and the important themes that it deals with. There are a couple of scenes in the movie that will make you angry, but these scenes also highlight what incredible restraint Jackie Robinson had. A note of caution: The quality of this movie isn’t the best, since it hasn’t been digitally restored, and Robinson himself isn’t the world’s best actor. But the footage of his stealing bases and hitting the ball more than makes up for that.